This is a pair of pre-mounted Hyrax 1.9" Tires. 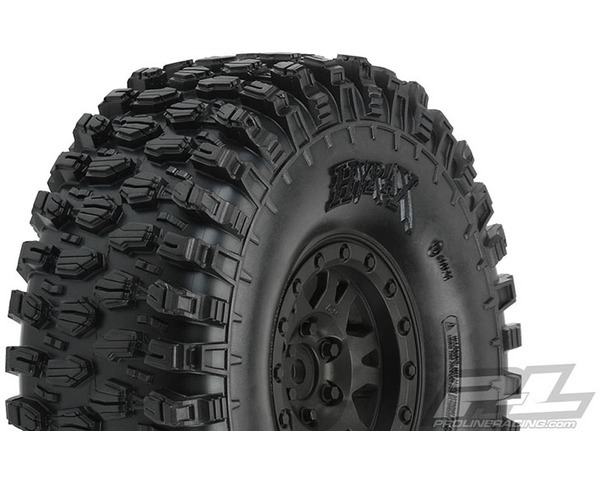 The future of 1.9" Tire Performance has arrived with Pro-Line's all-new Hyrax Tire! Designed from the ground up for maximum grip on the toughest terrain, the Hyrax tire is ready for anything your Scale Adventure might throw at you. The Hyrax features an aggressive and open tread pattern with each tread block containing multiple Sipes for incredible tread flex. The highly detailed connected tread on the sidewall of the Hyrax extends out for unmatched side-hilling performance. The Hyrax also features futuristic stepped tread blocks that create even more forward gripping edges that dig into slick rock like no other scale tire Pro-Line has produced to date! The Hyrax is made from Pro-Line's Legendary G8 material, so you know it provides performance you can depend on. The Hyrax 1.9" tire comes conveniently pre-mounted to our Impulse Black Plastic 1.9" wheels that are Proudly Made in the USA! These all-new Impulse wheels are designed to not only look scale but to be super easy to use by only requiring 6 screws per wheel for mounting tires. The unique 3-piece plastic wheel design bolts together in the back and locks on to Pro-Line's incredible list of 1.9" Crawling Tires. The back of this 12mm hex Rock Crawling 1.9" wheel also accepts Pro-Line's Brass Brake Rotor Weights (sold separately) for additional looks and performance.